Donald Trump again pushes conspiracy theory that “other communities” trying to steal election. 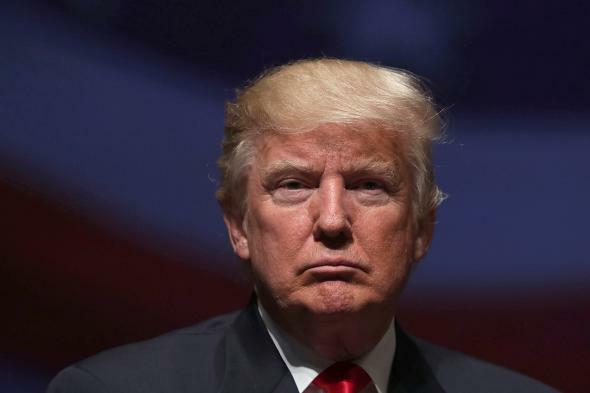 Donald Trump is doing what he does best stoking fear and assigning blame. Donald Trump made a very Trumpy first post-debate appearance Monday afternoon in Pennsylvania. In his Ambridge, P-A rally, Trump hit many of the same notes he gonged the night before during the second presidential debate of the campaign—a.k.a. the least uplifting debate in American history—while amping up his nostalgia for the glory days when Americans leisurely mined coal and ate steel for breakfast. Those were the days. Trump’s contrived nostalgia for things that once were has reached a point where the next logical step is he demands we rebuild America’s Styrofoam industry. Because science is for squares and nobody beats America. One particularly disturbing theme Trump hit on again in Ambridge is the conspiracy theory that the Donald has been setting up for quite some time now that the election is going to be “stolen.” From him, obviously. Not by him. He would never do that. To further stir the pot of fear and loathing that certain segments of his supporters feel for others that don’t look like them, he again told the Trump faithful to be on the lookout for “other communities” when it comes Election Day. What communities could Trump possibly be talking about? Would it, perhaps, be the same “communities” (of Americans) that Donald Trump and his supporters want to take “our country” back from? Trump doesn’t say. Because saying it would be overtly chauvinist and bigoted, implying it gives the campaign just enough wiggle room to gaslight the country later on. It’s unclear why Trump has drawn a seemingly arbitrary line of decorum and doesn’t say explicitly what he’s implying. Perhaps, like his ISIS strategy, it’s a secret. “You know what I’m talking about…” In Pennsylvania and beyond, Trump is actively recruiting those that believe they do. 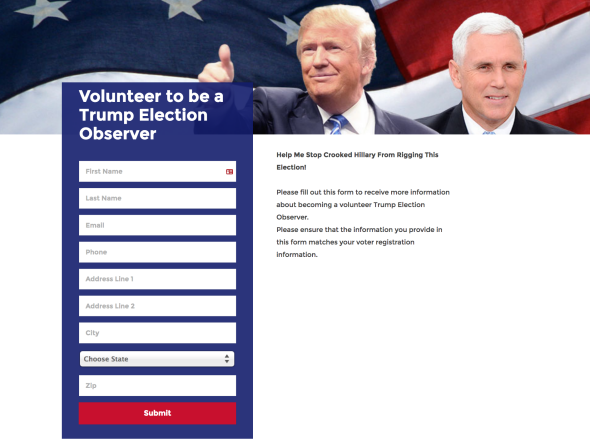 “Election Observer” sign up page on Donald Trump’s campaign website.